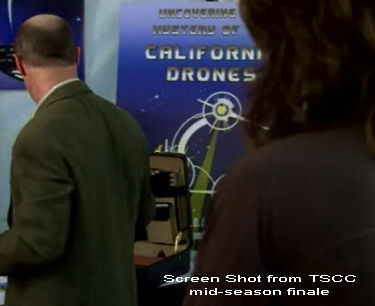 California Drones Mystery Solved By Sarah Connor Chronicles? The mid season finale of Terminator: The Sarah Connor Chronicles (TSCC) threw me something to chew on Monday night that I was surprised to see. Was TSCC yet one more project that was bitten by the writers strike? When the heck are we gonna stop seeing ramifications from that event? Cripes! Confused? Good... Keep reading my Tarantino-ish outline of this event. In Monday night's episode, Sarah is chasing her "three dots" clue and ends up going to a UFO convention. There, she meets a "woman" who has pictures plastered all over "her" home's walls. The interesting thing about that is that I recognized those pictures and said, "Hey! I know those pictures! 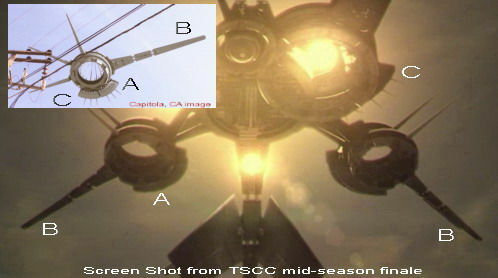 Those are the California Drones that Raji posted in 2007!" Yes, I'm a bit of a UFO non-disbeliever with a freaky memory! Flashback - Mid 2007:An internet user by the name of raji (Other surmised aliases: raji1977, Rajinder Satyanarayana) has laid claim to not only observing a UFO, but taking high quality pictures of the thing as it went over himself and some power lines. The pictures were taken in a town called Capitola, CA. which isn't that far from where I live, and about 3 miles South of Santa Cruz, CA.. The pictures were incredibly detailed, well focused and if this wasn't proof... well then, what is? Curious item #1: The photographs were put out on Craigslist of all places. Not a UFO forum, but a public, generic website. After posting the images, "Raji" disappeared. After that, a few other folks posted images of their own of similar craft that have been spotted around CA. These craft have been dubbed the California Drones. Background event to keep in mind: The writers strike started on November 5, 2007 and ended on February 12, 2008. January, 2008:A woman from London contacted a couple of private investigators to try and locate this Raji person. As their quest proceeded, they started working from the presumption that if they found the telephone poles, they might find the area where this "Raji" lives. I don't buy that. Why? If I took the pics in Capitola, I would have been passing through. I live in Menlo Park, on the other side of the mountain in the Bay Area. I'll call this Curious item #2. It's a great story on the LA Times website, but it sure did not say much. There's even YouTube footage of a Fox news program called America's Newsroom, which interviewed the two PI's. Yep, it's a real program. The PI's put together a web page on their site for their investigation: TK Davis Investigations. MORE RECENT DAYS:Despite the fact that I do believe, (just not sure in what), a lot of folk on the internet make a hell of a lot of conjecture about things. They pull facts and conjecture from every direction, pile them in a blender that's set to stun and turn it on without the lid! I say that because stunned is what I got. There are so many ideas out there about these "California Drones" that it gets very confusing. I filtered through literally hundreds of images, sites and conjectures to the point of stumbling through the day cross-eyed and even ending up at one of my own sites where I wrote an article about how UFO's capture our imaginations. From sites debunking the UFO, to sites supporting it, I toiled. Some sites had well presented and lengthy documentation. Other sites had forums with over 100+ pages of premises, conjectures and interpersonal angst. The Drone Research Team put together some of the original images that raji posted on Craigslist and has a collection of other images from other "witnesses." That "Isaac" fella put together a pretty comprehensive collection of information about this classified work and has some incredibly detailed images, scans, etc... which I will call Curious item #3! The sites are Isaaccaret.com and a second supporting site. The interesting (should I say Curious Item #4?) is that the Isaaccaret site has a page with the title/name of "Replicant." Hmm. I've done all this for you, the Screen Rant readers, at the risk of being abducted by government conspirators and the greys. Not to mention I was tremendously curious! Today I'm exhausted from chasing my own tail!! The end of Sarah Connor Chronicles' episode had Sarah laying on the ground stunned, looking up at what looked like a UFO coming down to say hi to our dazed heroine. That's when I said, HAH! Scared the crap out of my wife. 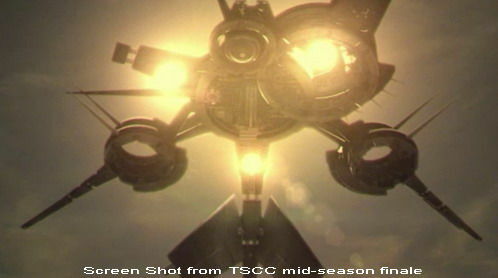 But the craft in the end scene was a combined derivative of the California Drones with identical details. FOX Networks is run by aliens! They were getting completely behind their product, The Sarah Connor Chronicles, by ramping up a viral advertising campaign that would draw the public into their show. With the right public momentum, the gimmick would have netted them some serious press coverage and ratings. But the project got snuffed when the writers' strike hit. That pushed back the airing date of this mid-season finale episode, and Fox moved on. In their wake, they forgot to let on about it and left the hundreds of UFO-ologists spinning up hundreds of thousands of hours combing over the Drones evidence and tossing out their conjectures. Below, I present the pictures for your review... To all the folks who dropped many an hour into this phenom, I do apologize, but I think you were taken by a pretty cool marketing scheme. 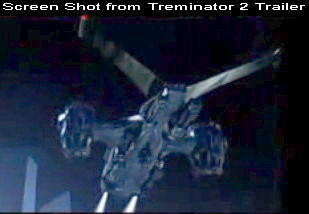 Terminator: Sarah Connor Chronicles Screen Shot: Notice the Drone poster. Notice the Drone image over a telephone pole. Oh dear, here they come Sarah! Notice the appendages changed. Moving. 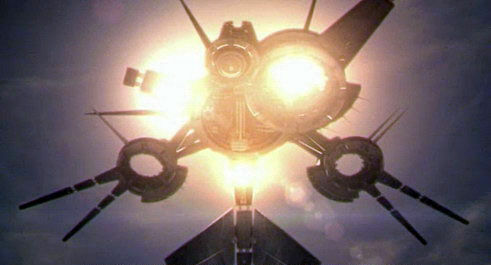 Does the CA Drone bear any similarities? 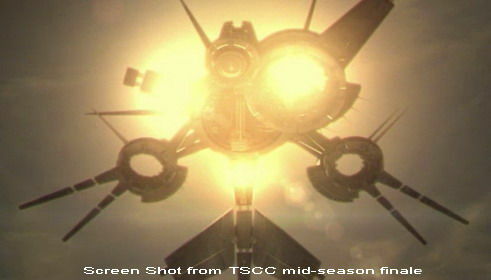 A: Notice the tail section similaritiesB: The tri-segmented extended armsC: The spikey things. Did Fox perpetrate the viral ad gone south, or did they take advantage of something that is out in the public domain and made it their own, risking possible legal issues? The drone/CARET materials are not viral marketing for our show. Fox knows nothing about them. I've been interested in the drone images for some time and, as I am wont to do, found a way to work areas of interest into the show. Our drone image at the end is a kissing cousin of the others but is of our own design. I don't want anyone out there who chooses to believe in the drone sightings to feel in any way that their inclusion in TSCC invalidates their point of view. Likewise, any one who believes they are a hoax should not use their inclusion in the show as confirmation of that theory. Simply something in the zeitgeist that I was (and still am) fascinated by. Whether this settles the issue or only serves to incite others who want to use it for their own ends is beyond my control.